Welcome to Minneapolis Pioneers and Soldier Memorial Cemetery (formerly known as Layman’s), the oldest existing cemetery in Minneapolis. Since the first burial in 1853 the cemetery has been the final resting place of those who helped shape the history of early Minneapolis. Several prominent territorial pioneers, including Charles Christmas, Edwin Hedderly, and Philander Prescott are buried here. Approximately 200 military veterans who fought in wars ranging from the War of 1812 to World War I are buried in the cemetery. It is the burial site for many of the city’s early African-American residents and for many people who had ties to the abolitionist movement in Minnesota. Several thousand immigrants, primarily from Scandinavia and Eastern Europe, are buried here, as are many of their children. Over half of the cemetery’s 20,000 residents are children. 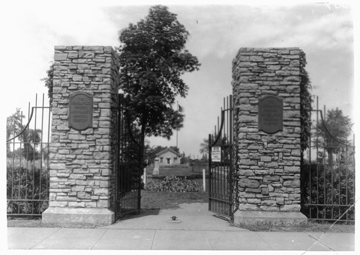 On June 2, 2002, Minneapolis Pioneers and Soldiers Memorial Cemetery was placed on the National Register of Historic Places—one of the few cemeteries that has that honor. It received its historic designation for two primary reasons: The cemetery has several distinctive architectural features including the caretaker’s cottage which dates from about 1871. Other decorative structures, such as the flag pole, the fence and gates, and monuments to territorial women and military veterans date from the 1920’s and 30’s. The second reason is the significance of the contributions of those buried in the cemetery to the social history of Minneapolis. This web site is very much a work in progress, and we welcome your participation. If you have family sketches or stories, biographical information, or photographs that you would like to share, please contact us at friends@friendsofthecemetery.org.